It's summertime, which means that Silas is on break from school and I get to spend time with him at my studio. Yesterday, Silas and I finished a project that he had started last week. I try not to involve myself too much in his design process: I let him find his own materials in the studio, figure out how he wants the pieces to fit together, and how he wants the final piece to look and function. I let him do all of the work himself except for the bits that obviously require adult supervision (e.g., if a piece of steel or wood needs to be cut). Silas tells me exactly where he wants the cuts to be made by drawing on the wood with a pencil or on the metal with chalk. Here's Silas' presentation of his first completed design. He did a great job! Silas and I will be doing more projects over the next few weeks. We're having a lot of fun with this so we may even turn it into a weekly blog post. Here are (finally) the photos of the Ceruse Dining Room Table. The wood top on this table is ash with a ceruse finish, and the legs have been blackened. This table had its premiere at Makers Market at Socrates Sculpture Park this past summer, and inspired a whole new line of ceruse tables (photos coming soon...). Thanks again to Csaba and Robby for their exquisite woodwork and finishing. Sara has been begging me to bring this table home. Every time I make a new piece for the house, it ends up in a store or someone buys it before I can get it home. I finally finished a new line of tables (photos will be up soon!) and was able to reclaim the Macassar Ebony Dining Room table and get it in the dining room before Christmas. A great big thanks to Csaba, Istvan, and Laszlo, my superstar Hungarians next door, who do amazing woodwork. The 3rd annual Makers Market, a curated exposition / marketplace of contemporary design, is going to be at Socrates Sculpture Park in Long Island City, Queens next Thursday, June 23 through Sunday, June 26. I'm going to be showing some new designs and pieces there. Come on down and say hi! There are also some great free workshops happening at Socrates next weekend. On Saturday there's a sculpture workshop for kids called Trash to Treasure: Reclaimed Wood from Noon to 3pm. Kids can design and build their own furnishings using reclaimed wood and other recycled materials. There are still some spaces available for the Spring Session #2 of Beginning Welding and Metal Sculpting Classes at Michael Daniel Metal Design in LIC-NYC ! Spring Session, #2: Thursdays March 10 – April 7, 2011 Hours: 6:30pm – 9:30pm Class is limited to 7 students. Go to www.michaeldanielmetal.com/classes for more info and to register online. For a long time now I have been promising Sara and Silas that I would bring home a new dining table. Well, I finally finished it and as soon as it was done it ended up in a store. Yes, the family is a little disappointed but happy to see it out in the world. Silas even helped Sara choose the backdrops for the photos. 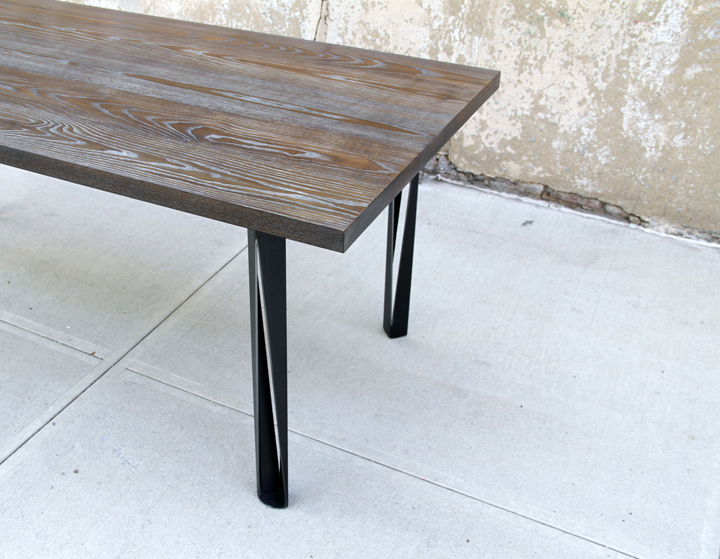 The Macassar Ebony Dining Table is available through Michael Daniel Metal Design and at Voos Furniture in Williamsburg. More metal sculpting classes in 2010! I just posted the schedule for the next round of classes on my site. I'm offering a 5-week session starting Wednesday, January 27, and another 5-week session starting Wednesday, April 7. Click here for the Spring 2010 schedule. Just a quick note that I'm teaching two sessions of Beginning Welding and Metal Sculpting this fall. Spaces are still available. The course description is available on my site here. Please feel free to contact me with any questions about the class. And Happy Back to School Day everyone! My neighbor, Laszlo Sallay, exhibited at ICFF this year and asked me to design a base for one of the table tops that he wanted to display in the show. Laszlo is an amazingly talented woodworker who does a lot of great veneer finishes, restoration work and came up with this new design on wood called Shagreen. Shagreen is basically a faux sharkskin-type look and texture but is 100% wood. When I was at the show on Saturday, Laszlo was getting a great response and there were a lot of people in his booth. Check out more of Laszlo's great woodwork and finishes on his website. I started teaching welding and metal sculpting again last week. I've got a great group of beginning students, who are all eager to learn. It's been a while since I've taught, but it's nice to see students get excited about learning skills that I now do without even thinking about it. It reminds me of how excited I was when I took my first welding class so many years ago at SVA. I knew after the first session that I wanted to do this the rest of my life. Finally, after months and months and months, I was able to get around to making a removeble, decorative fireplace screen for the wonderful Chee-Zefi family. I needed to make a screen that was also childproof, so I designed this screen to lift up and out -- easy for an adult but too heavy for a child. 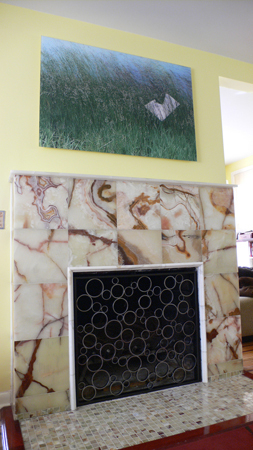 This fireplace was constructed out of various sizes of recycled plumber's pipe, which I wire brushed. I then welded the pieces of pipe into a tubing frame that has a blackened finish. I've been meaning to post pictures of the completed window guard and sign for Il Bambino, but have been caught up with finishing last minute orders for Christmas. I'm documenting the rusting of the steel, so I'll have more photos as the months go by. Also, I'm working on votive candle holders for Il Bambino's tables so I'll be sure to post the work in progress after the holidays. I was doing a bit of research the other day and found myself on the Apartment Therapy Re-Nest blog. There's a great post there about a group of Thai monks that built a beautiful temple out of a million or so recycled glass bottles. This reminded me to let everyone know about a great organization in my neighborhood called Build it Green! NYC. They have really good recycled wood, and when my friend Denny and I went there this summer, they had old doors from the Mohonk Mountain House. I've been working with my friend Igor on a large-scale project over the past several weeks, which have required a lot of extra hours and weekend work in order to meet the deadline. Unfortunately, I missed the Halloween Harvest Festival at Socrates Sculpture Park this past Saturday. Sara and Silas went on without me and had a great time. In addition to the make-your-own costume table and the dog halloween costume contest, there was also live music. Sara and Silas weren't expecting the musical stylings of Peelander-Z. Silas was completely mesmerized by the band and talked non-stop about them for the next three days. This is why Queens can be an awesome place to live. You just never know what you're going to get. 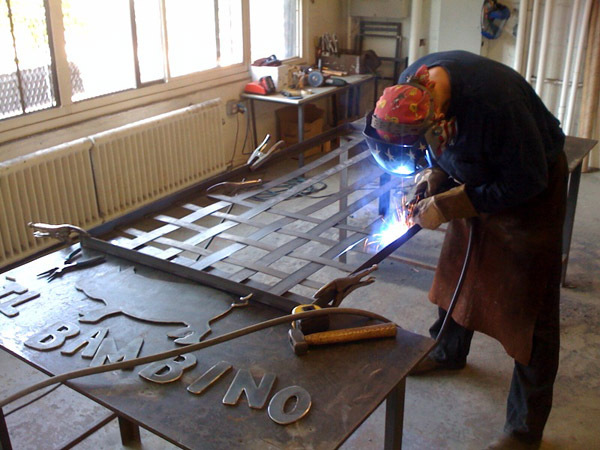 Darren came by the studio yesterday and took a look at the finished window gate and sign for Il Bambino. We decided to let it patina naturally in the elements instead of painting it. Darren was super psyched and was sorry that it was going to end up in back of the restaurant instead of the front. Ready to go to Il Bambino! We started going to this great cafe in our neighborhood right after Silas was born. It had just opened a month or so before, so it was perfect timing. We were so happy to find a comfortable spot to go with the little man, where we could get really good food and coffee. Darren, the owner, is a really great chef and fun to chat with. I made a bench for Il Bambino last summer, and we sat there almost every evening and had coffee (well, not Silas). Darren is going to expand the restaurant with outdoor seating in the back garden, and asked me to make a window guard and sign for the back.